Well, I really didn’t think it would take a year to finish off the upper driveway project, but here we are. Grass grows REALLY SLOWLY in deep shade. Just sayin’. 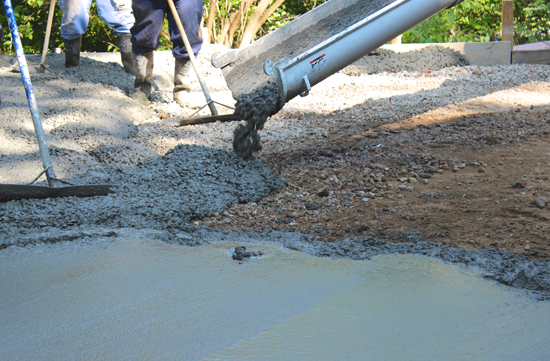 You may recall, many moons ago, that when we replaced the driveway, there was an area under our huge elm tree where we did not re-pour concrete. It has been a parking pad, and we still needed it, but wanted to minimize stress to the tree’s roots and opted instead for a permeable paver system. 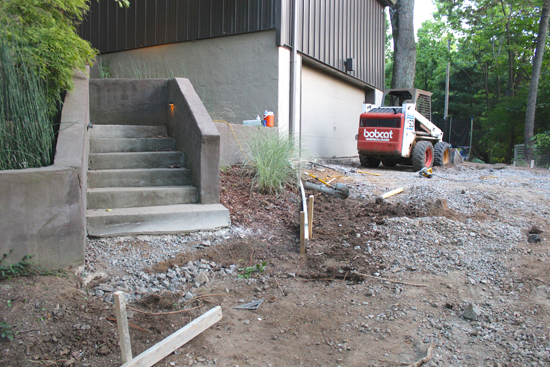 Not only does water drain down to the roots of the elm tree, we are maintaining a grassy spot underneath the tire swing – sort of. 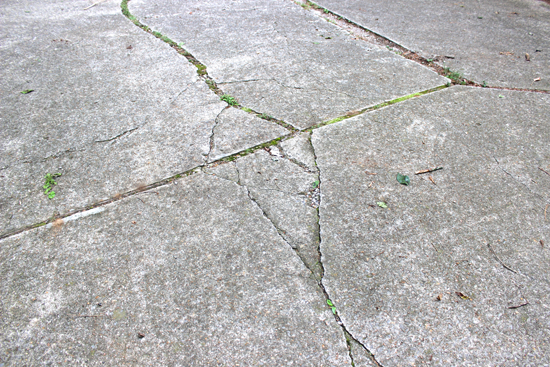 It turns to mud pretty quickly after the Halloween party, but at least it’s not a slab anymore. 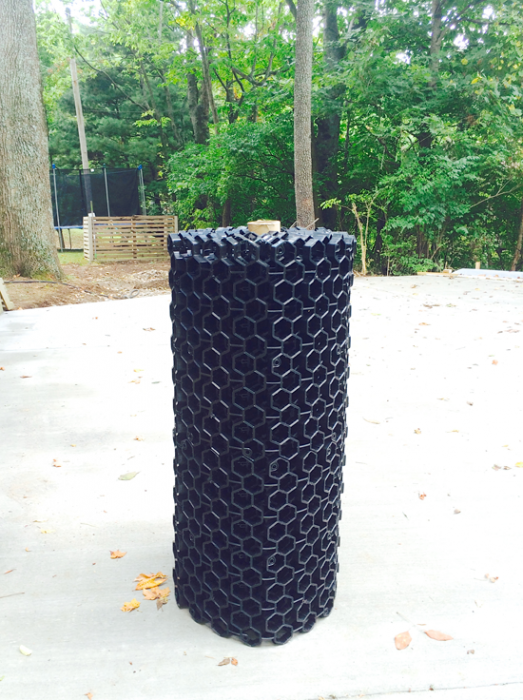 We purchased our paver mats from Landscape Discount which was the least expensive option we could find. We noticed that one of our local parks used the same stuff in their parking area, but instead of seeding it, filled theirs with gravel, so there are other uses besides planting it as we did. So as a refresher, here’s where we started. So, I am always yammering on about how the next big project will be our master bath, and OH, how I wish it could be, but this house has a way of bumping the jobs we WANT to do with jobs we NEED to do. 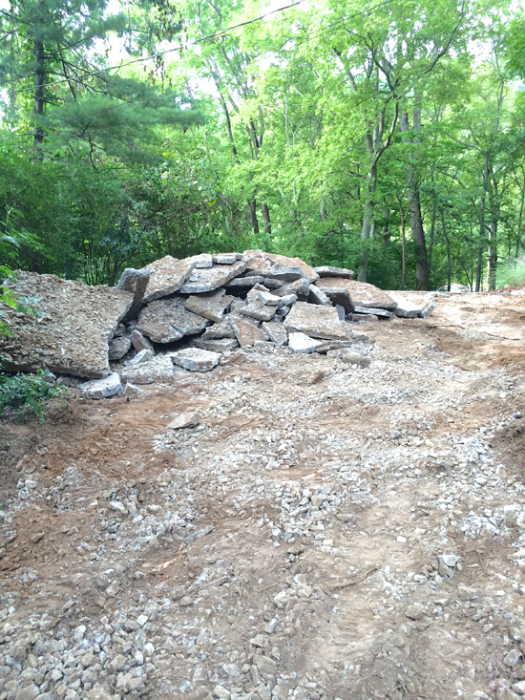 The driveway had become a situation we could no longer ignore. We had the original concrete driveway that was poured when the house was built in 1977, and I will list the problems that old slab had going for it. -The expansion joints were originally filled with wood, that over time rots out, allowing water and critters to enter the scene. 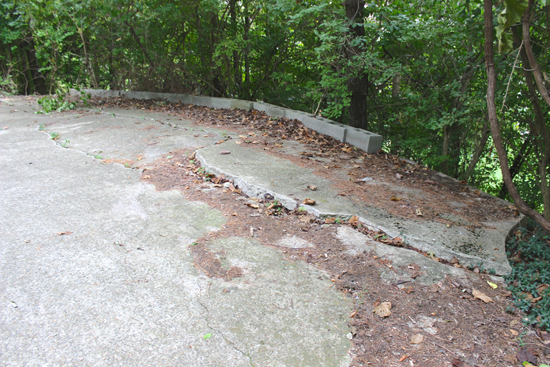 -Two giant sections of that old concrete were cut out and repoured when the foundation was underpinned sometime in the late 90’s. 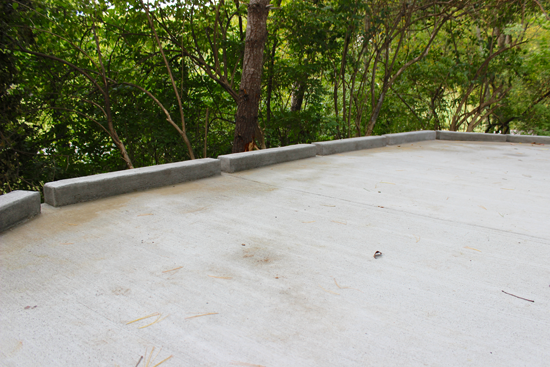 Now, those pieces have settled, pulling away from the house, and again, allowing water to enter under the slab. 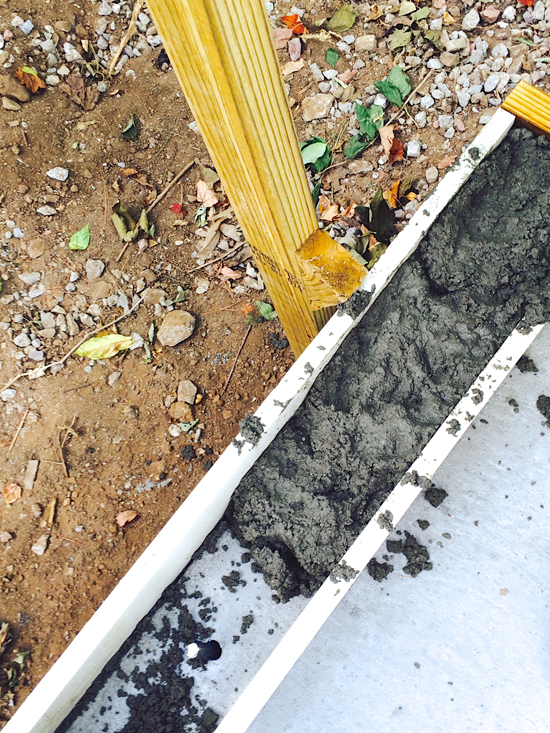 -The drain connecting to our gutter downspout, that was installed when the driveway was laid, well, it was the wrong kind…the one with HOLES so that water has been flowing under the slab for decades. -Aaaaand lots of large trucks driving on it during previous renovations created baby new cracks, to keep the old craggy cracks company. I consider this to be an alternate renovator’s slang for crack baby. You heard it here. 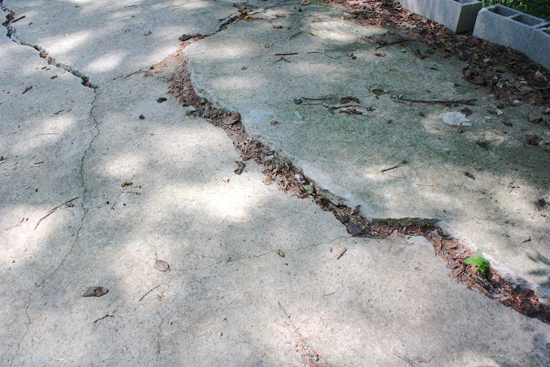 ALL of this equals a nightmare hot mess ofÂ cracked concrete. Behold. 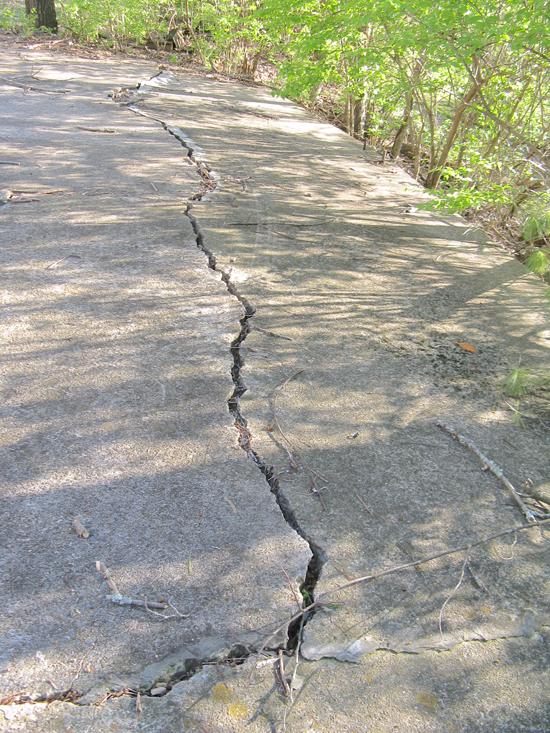 The work was scheduled to start on Tuesday, and we discovered on the prior Saturday that a yellow jacket colony decided to set up a ground hive down in one of the cracks. I mean, REALLY?! Ugh. Hive out, and it was showtime! 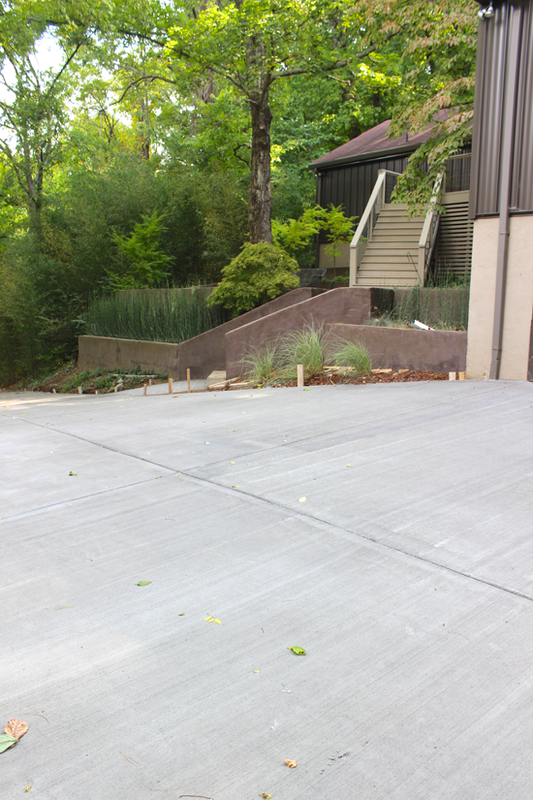 We only replaced the top portion of the driveway and the turnaround. 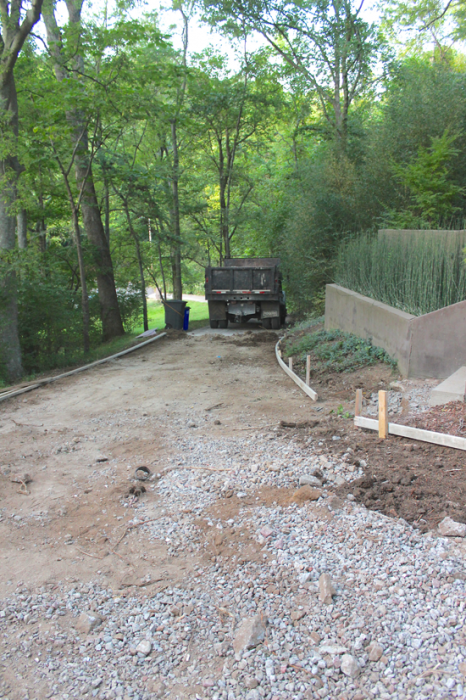 The rest of the driveway is pretty good for its age, so luckily for our budget, the rest can wait.Â The truck is where the new work stops and joins the old part of the driveway still in decent shape. 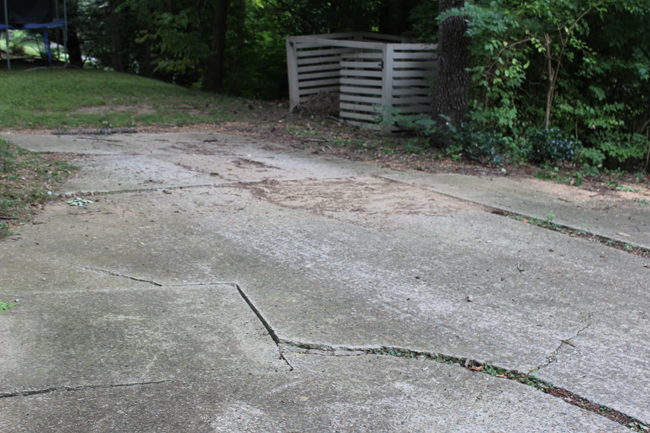 As luck would have it, when the concrete truck drove up the driveway – it broke one of our perfectly decent slabs. 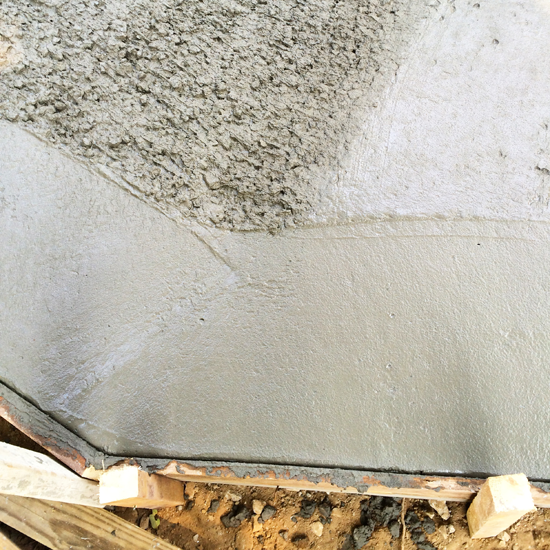 They very kindly offered to fix it on the spot after the top was poured, BUT, it causes me angst because my inner OCD has a hard time with this…this….Frankendrive. ARGH! Don’t look. 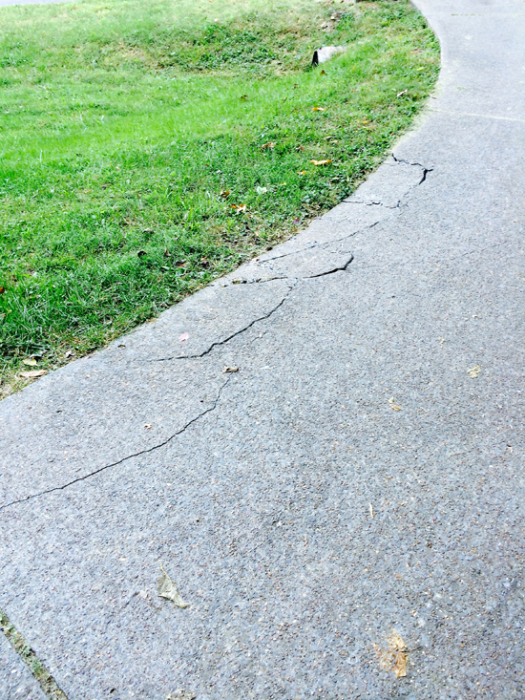 It also created some hairline cracks (more crack babies) in a couple of the other slabs, so I’m sure we’ll have to replace the rest in a just few years…sigh. 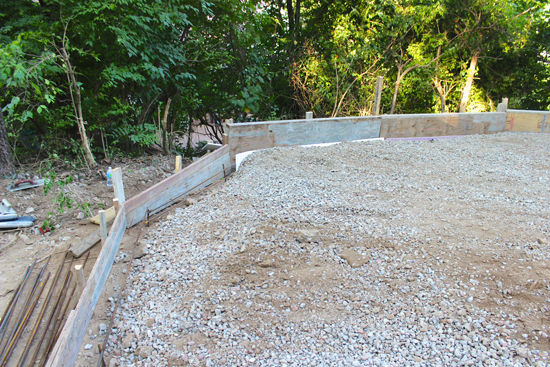 We need to re-pour our garage slab too, but it just wasn’t in the budget, (knowing this job would likely go over budget..and it did) aaaand we have some joint sistering to do in there before we tackle the floor, so it just had to wait. It would have been SOOOO much easier and cheaper per sf to do it all at once, but that’s life without a money tree. 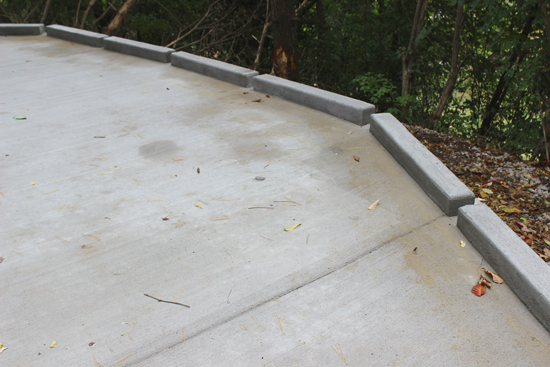 The next phase was a DIY – the CC poured 4 foot curb sections around the far edge so we don’t lose anyone down the hill. We are mildly considerate like that. 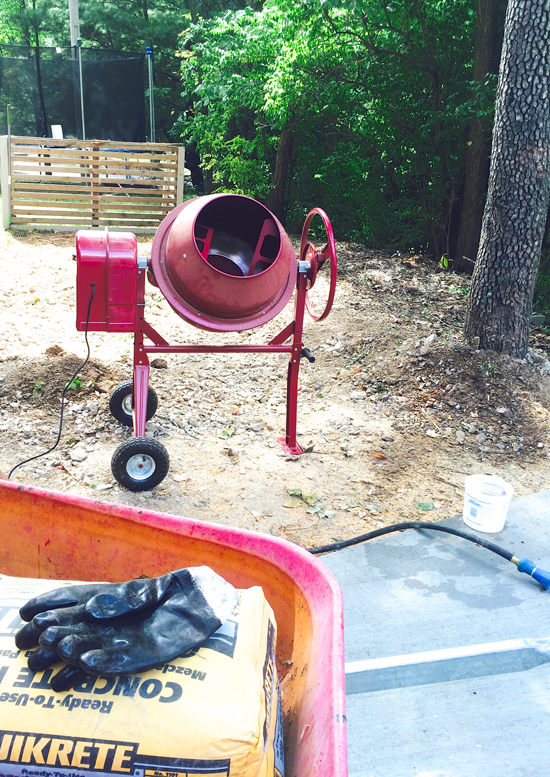 Having the curbs poured at the same time was going to add a lot of labor cost, but not concrete cost, so we thought we could handle that on our own. To this point, our driveway has freaked people out since it’s a pretty steep drop-off from the far edge. Example: Our substitute mail carrier won’t come up our driveway at all, and just leaves packages and everything at the bottom of the driveway. That’s why we had the hideous row of cinder blocks along the edge, plus it kept balls from rolling down into the Nether. 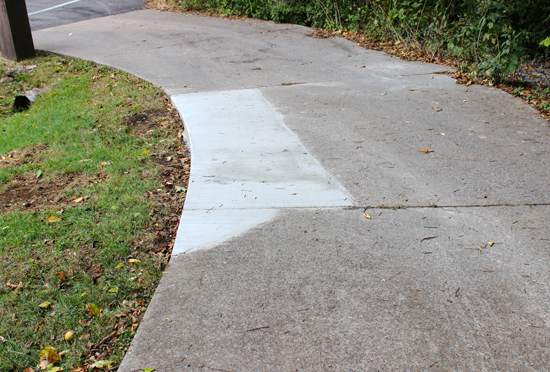 The spaces between the curbs allow for water runoff and leaf clearing. He drilled steel rebar into the new driveway to anchor the new curbs to the slab. 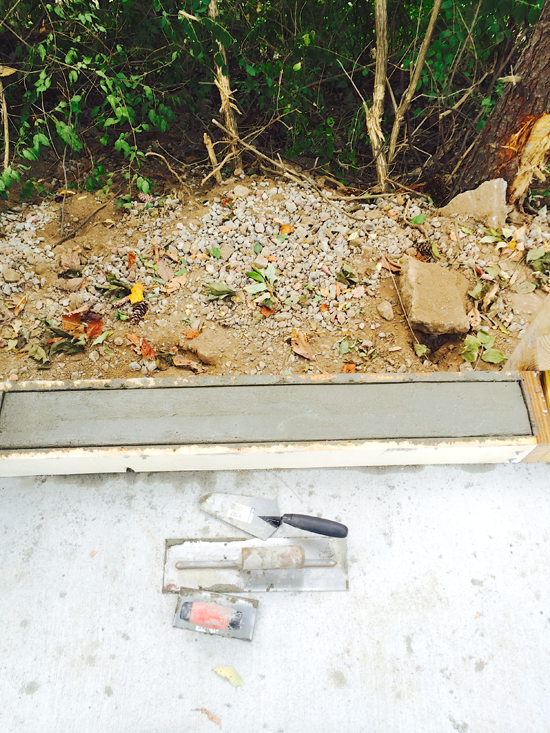 After the curbs, phase 3 is the permeable paver installation- another DIY. We are going to lay down this stuff between the base of the 2 trees behind it. There used to be a concrete pad there as overflow parking for the driveway, but it was hard on the roots of the big ash tree. 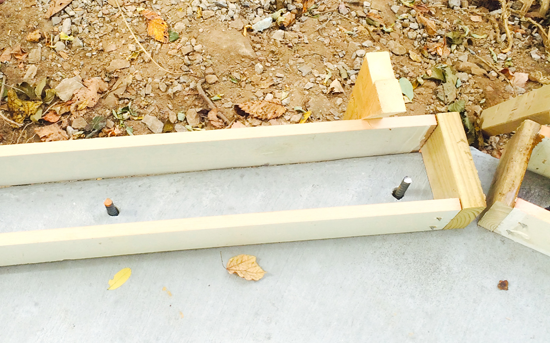 Hopefully this solution will be friendlier to the tree while giving us the extra parking we need. 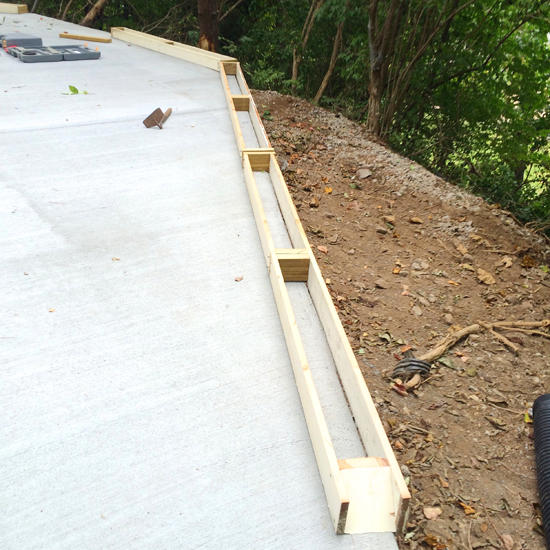 It is a roll out grid that is filled with either gravel or soil and grass/groundcover that allows water to pass through the cells, yet is strong enough to be driven on. Our plan is to seed grass since it is also at the base of the tire swing.Â Hopefully it will be a significant benefit for both the trees, and stormwater runoff. Phase 4 will be to put a slatted fence behind the curbs to make those parking and turning around up there feel more secure, and a few years down the road, I guess we will add more sections of driveable grass to accommodate MORE DRIVERS in the household. GULP. 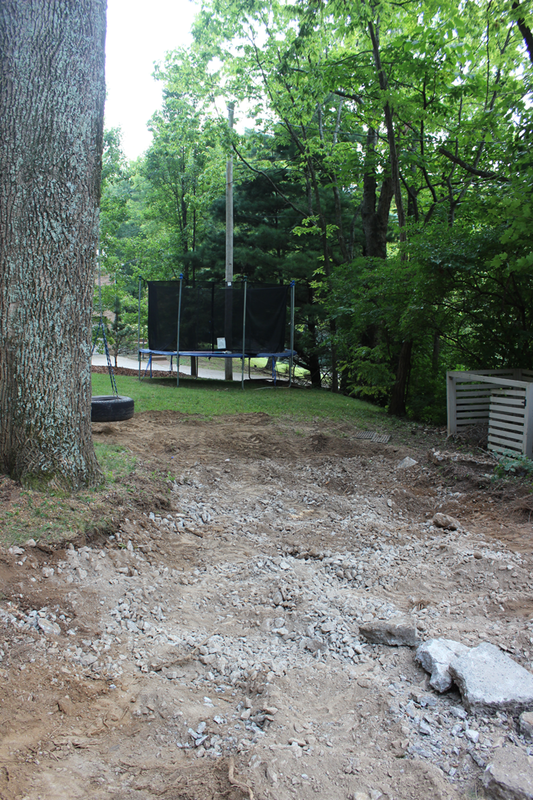 Stay tuned for the paver installation, We have 6 tons of gravel to create the base being delivered Tuesday, so it will be a lot of shoveling and trips up the driveway with the lawn tractor. WHY you ask? 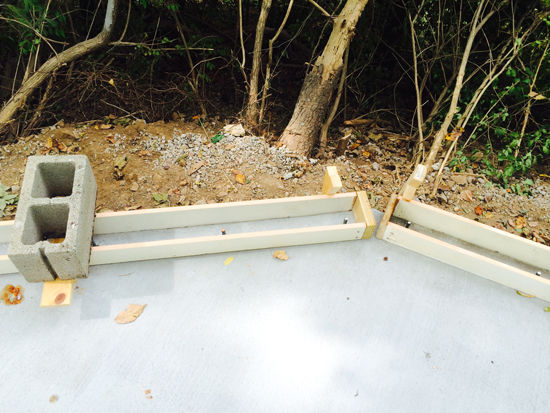 Â Because the brainiacs here didn’t think to have it delivered/dumped in place BEFORE the new slab was poured. 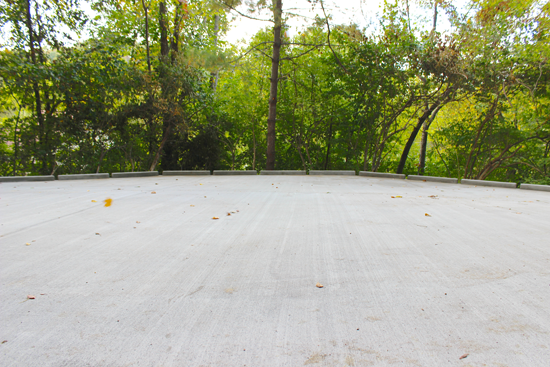 No trucks on the new slab for 6 months minimum. I’m usually a good renovation planner in terms of sequence, and this was an embarrassing miss. I guess it’s a good work out though….